The team is now performing DNA, radiocarbon and other tests on bone samples uncovered at the cemetery, dating back to between the 11th and the 8th centuries B.C., to help resolve a debate about the Philistines’ geographical origins. The archaeologists have not announced any conclusions, saying they are taking advantage of recent advances in DNA testing to get the most accurate results. 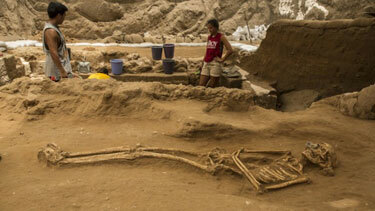 The discovery of a sizable cemetery, with over 210 individuals, at a site conclusively linked to the Philistines, was a “critical missing link” that allows scholars “to fill out the story of the Philistines,” said Master, a professor of archaeology at Wheaton College. The cemetery, discovered just outside the ancient city walls and dated to between the 11th and 8th centuries BCE — a period associated with the rise of the Israelites — may contain thousands of individuals, providing an abundance of material to study, he said. With that broad a population, “we’re going to be able to reconstruct what the Philistines as a group were like,” Master said. The announcement was timed to coincide with the opening of an Israel Museum exhibit showcasing finds spanning 6,000 years from Ashkelon at the Rockefeller. Among the items on display are 3,800-year-old city gates, gold and silver jewelry demonstrating its commercial prominence, and a Roman marble slab etched with Crusader and Fatimid inscriptions. Throughout much of its 22 layers of settlement, Ashkelon was a “great seaport,” situated on the Mediterranean and on the main coastal trade route,” Harvard University’s Larry Stager, co-director of the dig, said. It was significantly larger than cities inland during the Bronze and Iron Age, with 10-12,000 people, because it could sustain greater population through commerce. Ashkelon was one of the five main Philistine cities for six centuries — , along with Gaza, Ashdod, Gath and Ekron — from the 1100s BCE down to Ashkelon’s destruction by Babylonian king Nebuchadnezzar’s army in 604 BCE. Isolated graves containing Philistine style pottery were thought to be possible examples of their practices, but the few cases were not enough to convince most scholars. Scholars believe the Philistines were among a number of tribes of non-Semitic peoples who migrated across the Mediterranean — possibly from modern Greece and Turkey — and settled the Canaanite coast in the early Iron Age. the Archives of Never Yet Melted in the 'The Bible' Category.